I was born on 18th November 1988 in Dresden, East Germany, under the sign of the Scorpio as the second of three brothers. I was a courious boy with the urge to press every button I could reach and so to tame and distract me my parents bought me a little Casio keyboard when I turned four. This must have been the time when I explored the musical genes I got from my parents. They supported me the best they could and when I was six I started taking keyboard and piano lessons for rock, pop, jazz and classical music - which I did for twelve years. At the age of eight my big brother, who learned to play the saxophone, and I started performing on stages and soon we founded a little band together with a vocalist. We played rock and pop music for about 14 years with up to 50 gigs per year. This is how I came to all my hardware synths. I also took classical vocal education for 5 years and taught myself the guitar. I got into music production after we had our first studio sessions and I was fascinated by all of the tech stuff they had in there. I mean, I composed and arranged songs since I was eight or nine but that was all midifile based. So I got some studio equipment and started hooking up my synths to the PC and started experimenting with all kinds of synth-based music. It sounded a lot like those old vinyls by Tangerine Dream and Klaus Schulze my father gave me when I was a child. I explored trance music around 2004, 2005 and it felt like the old feeling of these vinyls was mixed with some fresh beats and I instantly knew: I want to do this too! 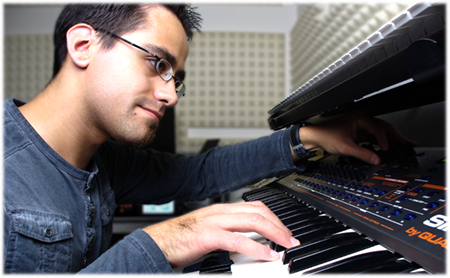 To support my work I studied audio engineering at the SAE Institute in Leipzig and got a diploma degree.